... and yet another idea how to put your kiddies' art projects to some good use. Give them a big piece of paper - I gather the thin paper they use in stores to wrap fragile items before they put them in your bag. Then give them some finger paint or simply washable paint and put them to work! After the paint dries and your child had every opportunity to share his/her art piece with all of his/her friends and other admirers, put it in the place you keep wrapping paper. When you need to wrap grandma's present - here you go. 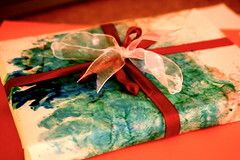 Not to mention that you help your wallet and the environment by wrapping gift with your kids' art.